Last spring my husband and I went on vacation to Galveston, Texas. 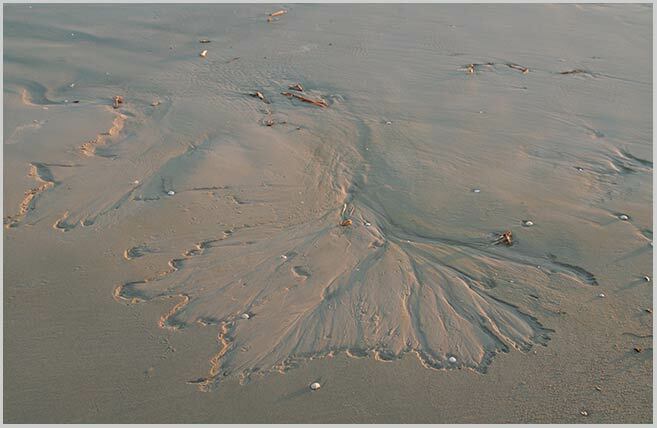 I wrote an article about what the Gulf's waters left behind on the beach each time they receded. These pictures can be seen in my Ocean Detritus Gallery. 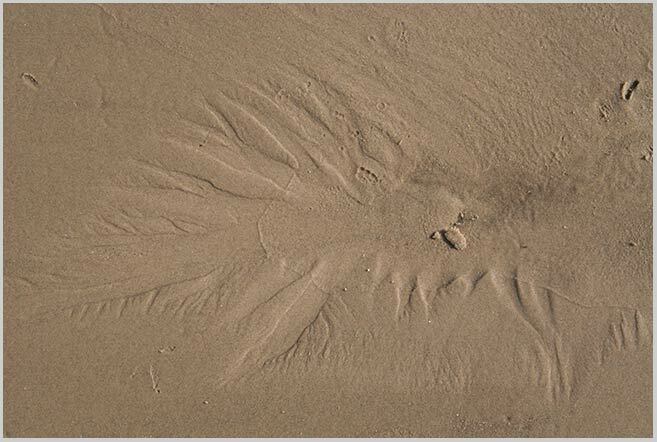 We went back to Galveston this fall, and while I also noticed what the Gulf "left on the beach," I was struck by the sand patterns it created as it receded at low tide. I am sharing these observations for two reasons because I found the patterns to be truly beautiful and, I found that this trip was about taking pictures of individual items - some small and some large, but still individual. 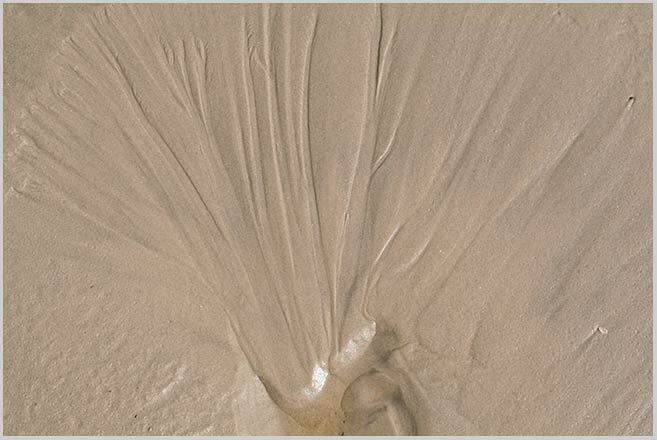 It made me look at the beauty of a bird in flight, the sun rising, a bit of foam, and sand patterns. The camera I used is a Canon Rebel XT and the lens is a Sigma 17-70 mm. I usually took the picture at 70 mm. In the early morning near sun rise and in the evening near sunset, I used an ISO of 400. Otherwise, I used an ISO of 200. The first picture is the only long shot I took, but I think it is a good introduction. The second picture represents the normal way I took the pictures. 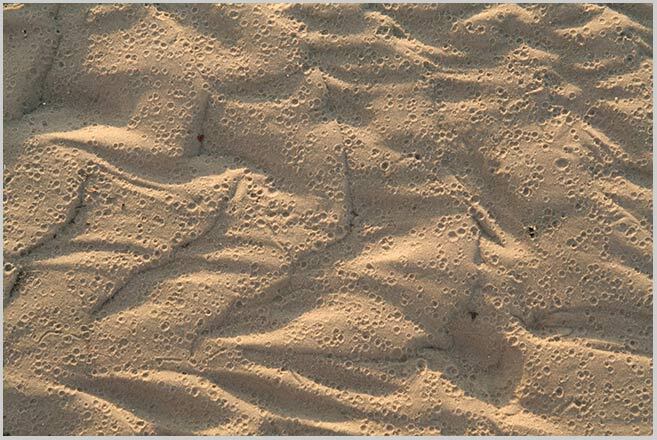 I stood over the image and focused on the sand pattern. I always faced the sun so as not to throw a shadow onto the image as well as to light it. As you look at the images, you will notice the change in color from the first image. The pinker ones were taken at the extremes of the day. The pattern below was a common one. This pattern was also common. Notice the flower-like fan shape at one end. The delicacy of the fan-like shape kept amazing me. 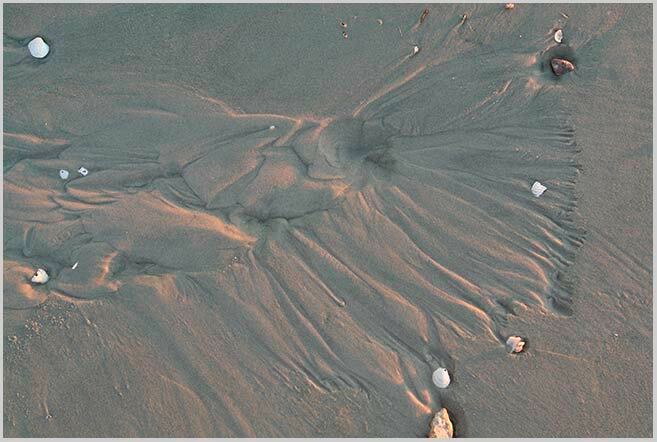 Here, the sand was wetter and grainier. I hope this has inspired you to look at the beauty of small natural phenomena. None of these pictures have been altered. 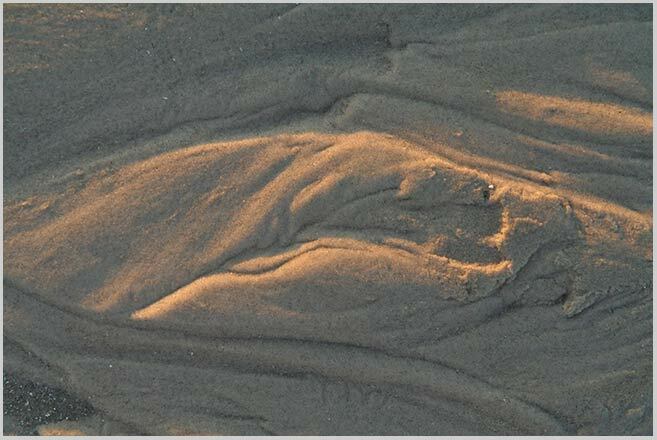 More of these images can be seen in my new gallery, Sand Patterns.